Informatics can enable clinicians to interpret information from multiple sources and inform decision-making in real time. One thing all healthcare stakeholders agree on is that our global health systems are near breaking point. The ageing population and increasing incidence of chronic disease, innovative technologies and new powerful drugs, have led to an unsustainable cost explosion, and it is not surprising that the pressure is mounting. The statistics make difficult and conclusive reading. Global healthcare spending is projected to increase at an annual rate of 5.4% in 2017–2022, from $7.7 trillion to $10.1 trillion. Rising demand for healthcare is exacerbated by high levels of clinical waste and unexplained variance in treatment and outcomes. It is estimated that $3 trillion goes to waste every year in healthcare with the US alone accounting for $1 trillion. Adding to the challenge are worryingly high staff burnout rates, administrative complexity and excessive and widely varying prices. As a priority, the global healthcare community is urgently seeking strategies and solutions to rebalance. Day-by-day, the healthcare community is collaborating to transition away from siloed and wasteful care delivery to more patient-centric and productive healthcare. But we need to act faster. 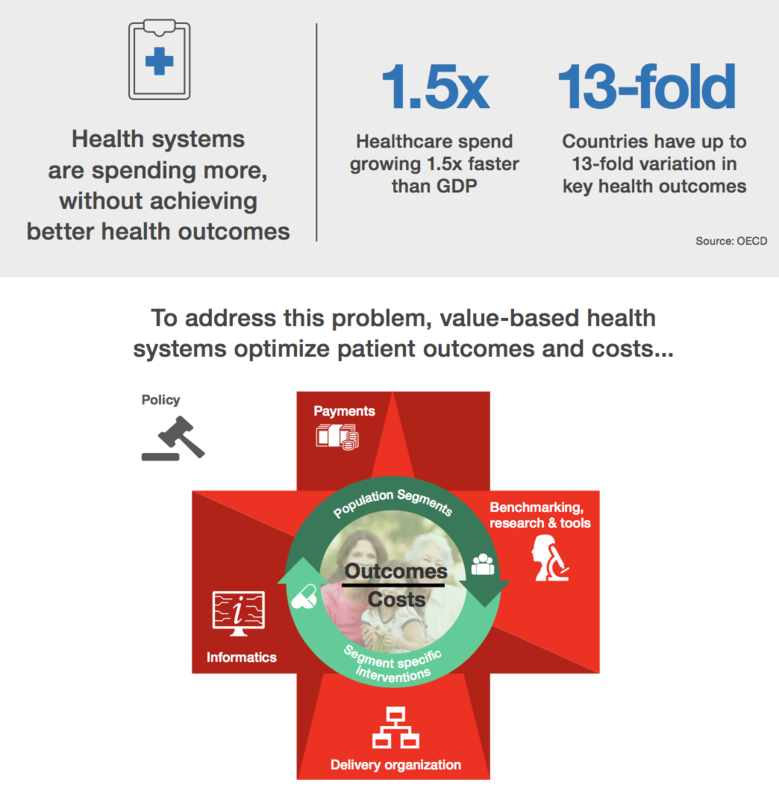 First originating as a framework by Harvard Economist Michael Porter, value-based care is a delivery framework to improve health outcomes at lower cost. It focuses on what patients value and allocates resources according to the health outcomes delivered by the system. Therefore, when put into practice to drive efficiency and raise quality standards, value-based care attaches incentives and payments to outcomes for patients and the population, not system workload. As a result, it encourages elements like quality, safety, the patient experience and their participation in decision-making by the care team. Most importantly, value-based care seeks to avoid unnecessary diagnostic and therapeutic interventions. With the right execution, it supports cost-effective care delivery while still being compliant with evidence-based guidelines. Compare this with the traditional fee-for-service model where every time you see a doctor or undergo a medical test or procedure, you (or your insurance provider) pay for every step in the process. This payment (or reward) happens regardless of whether a diagnosis or procedure is successful or not, and whether or not the steps taken are high-quality or even considered best practice. In other words, traditional healthcare is not necessarily working in the best interests of the patient. Value-based care seeks to address this contradiction by reorganizing healthcare around patient values, not volumes. However, we should not overlook the fact that access to care is also an important part of the equation. The Philips Future Health Index accounts for this in a “value measure” that assesses care delivery against the “Quadruple Aim”: better patient outcomes, improved patient experience, improved staff satisfaction, and lower cost of care. To align processes and incentives, one of the initial steps towards value-based care is the standardized measurement of (patient-reported) outcomes related to costs per capita. You start by measuring outcomes that matter to a particular patient, consolidate that on a population segment level, and then apply those insights to tailor and improve interventions across the care pathway for many similar patients. This forms the basis for promising care pathway innovation and lean process optimization that is really gaining momentum in healthcare. However, the all-important final piece of the puzzle comes in allocating an objective payment that is weighted according to how well the system performed for the patient. Historically, in health systems defined by silos, fragmented ways of working, and legacy IT systems, this approach has been difficult to implement. On top of this challenge to change, health systems and medical processes went digital with Electronic Medical Records, and clinicians soon found themselves overwhelmed by additional administration, while at the same time being insufficiently supported to make sense of large swathes of digital information. Leap forward a few years and, as digitization of healthcare gathers momentum, the situation is quickly improving. Moreover, I am convinced that we have a golden opportunity to standardize and bring meaningful scale to value-based care. The reason I am so optimistic: the steady integration of sophisticated health informatics. ⦁ Firstly, integrated health informatics can support medical staff in their decision-making, teamwork and communication – driving clinical excellence to new heights. ⦁ Secondly, health informatics helps connect operational processes – system administrators can analyze and optimize almost every operational aspect of the health system. ⦁ Finally, and significantly for value-based payments, health informatics can support the systematic measurement of patient-reported outcomes. This is critical to drive the performance-based payments and to incentivize much needed gains in quality, safety, and patient-centricity. It’s complex work that requires all stakeholders in the system (clinicians, administrators, technicians, technology partners and supply-chain partners, as well as policymakers and governments) to commit to the “measure, optimize, repeat” lean methodology, and standardized data formats to support common platform integration. The healthcare industry must confront and overcome these issues, especially as the medical Internet of Things (IoT) reaches maturity along with next-generation 5G connectivity. In spite of a growing pool of pilots and visible pockets of excellence, health systems are proceeding with caution. A recent survey of 364 healthcare executives in the US reported that just one third are experimenting with some form of value-based reimbursements. The industry needs to settle on clear definitions for patient-reported outcomes, and also agree on common protocols for measuring performance to then identify and eliminate variations. This is a baseline requirement. Pre-competitive agreements between all healthcare stakeholders will help to enable the automatic capture of outcome data from multiple sources, whilst also boosting the sharing of data among systems. This will allow differentiated reimbursement according to quality to be administered with consistency and transparency. Interoperable and secure data platforms are the basis for high impact and scalable health informatics, also fuelling further innovation and research. The transparent capture and reporting of data between systems, processes and stakeholders is vital for value-based care. Moreover, the challenge and stakes are so significant that it requires a full-ecosystem approach. To accelerate adoption, open and vendor-neutral digital networks must become the rule, not the exception. One of the most significant barriers to value-based care is that an incremental move away from the fee-for-service model that providers, clinicians and system payers have come to rely on is required. Given the unmet potential and pressing need to make healthcare more sustainable, we must seek out and experiment with innovative payments that share the risk and align incentives across care pathways and providers. Health insurance providers and government payers have a major role to play in expanding value-based care from pilot projects into an operational model that can be quickly scaled up. Ultimately, the widespread adoption of value-based care requires openness, trust and strong collaboration and partnerships between all healthcare stakeholder groups. Technology and IT deployments, legal and regulatory frameworks, clinical skills, training and payment reform must each be managed in a comprehensive and progressive approach to healthcare reform. It is a demanding and long road ahead, but it is vital that we seize the opportunity before us. I am convinced that we have what it takes.